Firstly let me apologise for the lack of a weekly newsletter last week, life got in the way and to be fair, not many famous people died over the last fortnight. However, we now have a bumper two week edition full of facts and news. Celeste Yarnall, 74, American actress (Eve, The Mechanic, “The Apple” (Star Trek: The Original Series)), ovarian cancer. Tony Hopper, 42, English footballer (Carlisle United), motor neurone disease. Sir Doug Ellis, 94, English entrepreneur and football club chairman (Aston Villa). William Coors, 102, American brewer (Coors Brewing Company). Paul Allen, 65, American businessman and sports team owner (Seattle Seahawks, Portland Trail Blazers), co-founder of Microsoft, non-Hodgkin’s lymphoma. 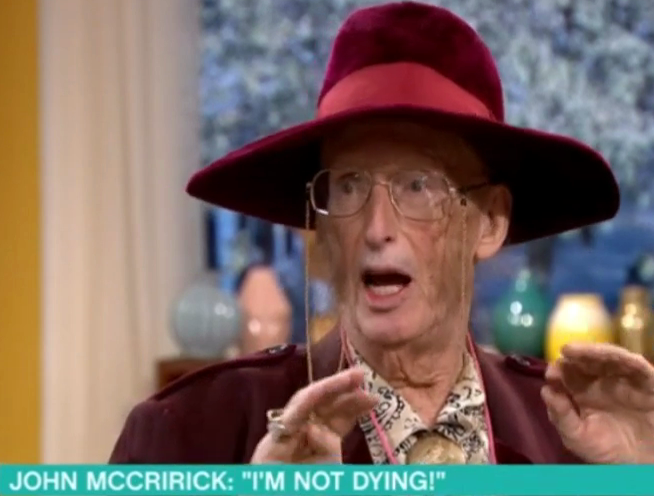 John McCririck, 78, sparked serious health concerns last week when he appeared on Bit On The Side. John, who presented on Channel 4 racing for over 30 years, began: “I’m getting better. I couldn’t speak for about three months. It really was awful.” The telly personality was struck down with the flu back in January. He added: “I’m recovering, but only slowly. “I’m not well. I’m never going to fully recover because age has taken over.” John urged audiences to “set yourself a target that you will reach. Have an aim, an ambition, a drive.” The former CBB housemate, who appeared in the 2005 series, said being sacked from Channel 4 contributed to his poor health. “I wake up in the morning now and I have no purpose in life,” he admitted. “I’ve worked over 50 years in my life. Work comes first, because you can’t look after your family if you’re not working. 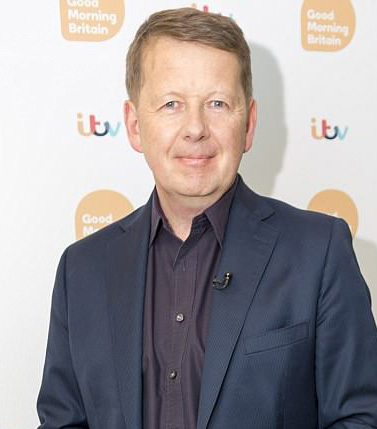 “You feel you’re lacking something.” Viewers were gobsmacked by John’s telly appearance and rushed to Twitter worried. One person tweeted: “It’s so sad when you see a usually strapping old man fade to virtually nothing! Wishing John well.” “This John McCririck interview is really uncomfortable. He’s speaking so incoherently,” said another. We’ll give him three months…. Selma Blair has revealed she has multiple sclerosis (MS). The 46-year-old actor shared the news with fans on Saturday, explaining how she had been diagnosed with the lifelong condition, which affects the brain and the spinal cord, in August. Writing on Instagram, Blair said that despite only just being diagnosed, she has been experiencing symptoms for years, leading her to believe she might’ve had the disease for more than a decade. The Cruel Intentions star begins the candid post by recalling a recent wardrobe fitting for Another Life, the 10-part Netflix series she is currently filming for, explaining how she has the “deepest gratitude” for the show’s costume designer, Allisa Swanson, for helping her into her clothes. “She carefully gets my legs in my pants, pulls my tops over my head, buttons my coats and offers her shoulder to steady myself,” Blair writes. “I have Multiple Sclerosis. I am in an exacerbation.” She goes on to thank the producers at Netflix for their compassion before illustrating how the disease is beginning to have an adverse effect on her daily existence. “I am disabled. I fall sometimes. I drop things. My memory is foggy. And my left side is asking for directions from a broken GPS.” MS is an incurable condition that disrupts the central nervous system and can cause a number of physically debilitating symptoms, including blurred vision, difficulty walking, muscle spasms and fatigue. Two months after receiving the initial diagnosis, Blair explains she is now “in the thick” of her illness and feels perpetually exhausted. 1322 – Robert the Bruce of Scotland defeats King Edward II of England at Byland, forcing Edward to accept Scotland’s independence. 1913 – Senghenydd colliery disaster, the United Kingdom’s worst coal mining accident claims the lives of 439 miners. 1926 – The children’s book Winnie-the-Pooh, by A. A. Milne, is first published. Viggo Mortensen (59), Danny Boyle (61), Snoop Dogg (46), John Lithgow (73), Michael Gambon (78), John le Carré (87), Zac Efron (31), Jean-Claude Van Damme (58), Pam Dawber (67), Paul Chuckle (71), Eminem (46), Mark Gatiss (52), George Wendt (70), Angela Lansbury (93), Tim Robbins (60), Suzanne Somers (72), Peter Bowles (82), Dominic West (49), Sarah Ferguson (59), Steve Coogan (53), Sacha Baron Cohen (47), Paul Simon (77), Chris Carter (62), Hugh Jackman (50), Robin Askwith (68), Michelle Trachtenberg (33), Emily Deschanel (42), Jane Krakowski (50), Joan Cusack (56), Stephen Moyer (49), John Nettles (75), Dawn French (61), Rose McIver (30), Manu Bennett (49), Charles Dance (72), Martin Kemp (57), Guillermo del Toro (54), Brandon Routh (39), Scott Bakula (64), Chris O’Dowd (39), Tony Shalhoub (65), Brian Blessed (82), Sharon Osbourne (66), Kristanna Loken (39), Matt Damon (48), Sigourney Weaver (69), Chevy Chase (75), Paul Hogan (79), Ardal O’Hanlon (53), Bruno Mars (33), Simon Cowell (59), Alesha Dixon (40), Tim Minchin (43), Thom Yorke (50), Britt Ekland (76), Ioan Gruffudd (45), and Bree Olson (32). This entry was posted on 21st October 2018 by kingofankh. It was filed under 2018 .